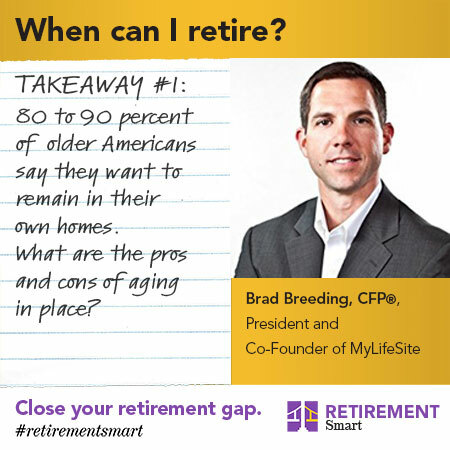 Planning for Elder Care by Brad Breeding – Takeaway #1: Should I age in place or move to a retirement community? Most people want to stay in their own home. You’ve probably seen the statistics that 80 to 90 percent of people say they want to remain in their own home, and there are some very good, perfectly understandable reasons as to why they would want to do that. When we talk about the different choices older Americans have, there are really two overarching choices. The first is to stay in our own home. The alternative if we don’t stay in our homes is to move to some sort of retirement community. What are some of the key reasons for staying in your home? It’s less expensive (though that is not always the case; it depends on the specific situation and the needs, particularly if someone has healthcare issues). It avoids the hassle of moving. For a lot of people, one reason why they never make a decision to look at some other options that could potentially be better for them in the long run, is that they don’t want to deal with their stuff. I don’t want to leave my home because I don’t want to lose my independence. Evaluate the practical and impractical implications about where you want to live in retirement. 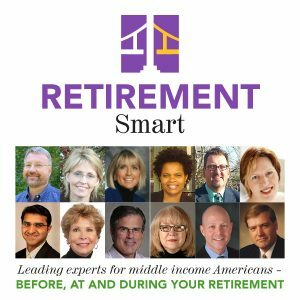 Possible home modifications, depending on whether there are stairs, the height of the cabinets, width of the doorways and hallways; things like that which may not be a big deal at all right now for somebody in that mid phase of retirement. For some people, it may require significant modifications; for others, maybe very limited. I saw an article that a financial advisor had written about spending almost $200,000 renovating his mother’s home because she really wanted to stay there. Within six months or a year, she ended up moving to a skilled nursing facility. So even with all that money they spent to help keep her in her own home, she ended up having to move anyway. Then the house was not as marketable because of the modifications that had been made. Maintenance of the home. Interior and exterior maintenance can become quite burdensome over time and be an expense. The risk of social isolation. As people age, their mobility becomes more limited. Over time, the risk of social isolation for someone staying in their home is much greater than it would be in a community setting. How to maintain social engagement is important because social isolation has a dramatic impact on somebody’s health with everything from depression to heart disease. I just saw a study that mortality rates have increased 26 percent for those who are socially isolated versus those who stay more actively involved and engaged socially. It’s becoming a very big health issue. Maintaining purpose kind of goes along with that; everybody needs a purpose in life. With staying in the home, it’s important to ask what am I going to do to wake up every morning and maintain purpose, or find renewed purpose? What’s going to give me that sense of purpose in my life? A lot of times, where somebody lives can really impact that, and who they have around them. Transportation challenges. I think it’s a little too early to tell right now, but at some point, it will be neat to see what groups and ridesharing programs can help older adults that could make an impact. As it stands now, a lot of times when someone is unable to drive, that can lead obviously to less independence and not more independence. People need to consider how they’re going to maintain a balanced, healthy diet in their own home. I saw with my own grandmother; she tended to fix the same canned foods over and over, every day. It’s just not the best thing to do from a dietary standpoint. Delaying a move. A lot of times, people who want to say in their home end up having to move at some point because of a health concern, and the problem is that it becomes a needs-based move rather than a move made of preference. Usually, the person making the decision is not the person who needs to move. At that point, it’s usually a family member. It can become a very difficult situation, and the older someone is and the longer it is before they make a move, the more difficult it can be. It can be a very dramatic issue for them emotionally and physically. That’s particularly a problem in the case of couples. If one is independent, what happens if one of us has a stroke or heart attack and we need care, and the other one is still independent? How is that going to work? They might be separated. In-home care where a person stays in their home and brings in care. Of those who stay in their homes, about 90 percent of older adults are cared for by loved ones in this country. There are 44 million unpaid caregivers in our country, and they’re providing the equivalent of $300 billion per year for the care of loved ones. Up to 70 percent of unpaid family caregivers have clinical signs of depression. They have chronic health conditions at nearly twice the rate of non-caregivers. 50 percent of caregivers say caregiving takes time away from friends and family members. Many times, a caregiver must take time away from their own career. Maybe it’s even retiring early. It’s becoming a big deal in the corporate world right now; how do we deal with this growing trend where more and more of our staff are having to take time away from work to care for an aging loved one? Loss of wages also means that’s less than I can contribute to my retirement accounts, and it also can have an impact on Social Security benefits. When you take the present value of that loss of future benefits and wages, it comes to about $304,000 on average. So people may think it’s less expensive to have family help, but that the cost is getting indirectly passed on to the next generation in the form of lost wages and benefits.